Arlington National Cemetery, Arlington County, Virginia, U.S.
Claire Lee Chennault (September 6, 1893 – July 27, 1958) was an American military aviator. 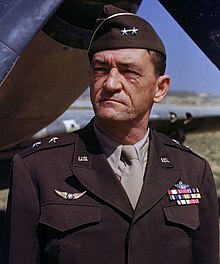 He was best known for his leadership of the "Flying Tigers" and the Republic of China Air Force in World War II. Chennault was twice married and had a total of ten children. From 1947 until his death in 1958, he married Chinese reporter Anna Chennault. Chennault was promoted to lieutenant general in the U.S. Air Force on July 18, 1958, nine days before his death on July 27, at the Ochsner Foundation Hospital in New Orleans. He died of lung cancer in New Orleans, Louisiana on July 27, 1958 at the age of 64. ↑ Byrd 1987, p. 367. This page was last changed on 4 April 2018, at 05:17.